Noted. | FineStationery.com: Happy Valentine's Day Weekend! I love these images from Grazier Photography and thought they'd be the perfect way to send you off into this snowy Valentine's Day weekend. 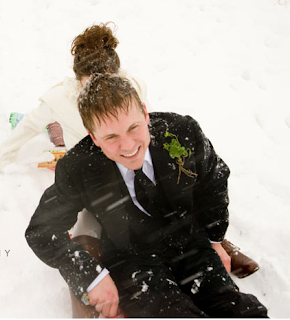 This fun-loving couple held their entire wedding ceremony on a hillside during a snowstorm. Don't you just adore the getaway "car?" Be sure to check out the Grazier Photography blog for more great photos!